Cyber Security and Privacy Foundation (CSPF) has made a contribution of INR 1,00,000 to the IronWASP project. IronWASP is an open source project that is used by tens of thousands of people around the world. Some of the users contribute by providing feedback, reporting bugs and by spreading the word amongst their peers. The project is financially supported only from my personal funds. Although a few interested parties wanted to support the project in the past, they wanted to ultimately kill off the open source scanner and turn it in to a commercial product. So I had turned them down but this is the first time we have received financial contribution from an external party that only wants to help the open source initiative. This is a very nice gesture, so a big thanks to J Prasanna of CSPF for doing this. I spoke about this feature and the technique behind it at nullcon last week and here it is as promised! Discovering vulnerabilities on the client-side is a tough task particularly because of the lack of tools that make this possible. 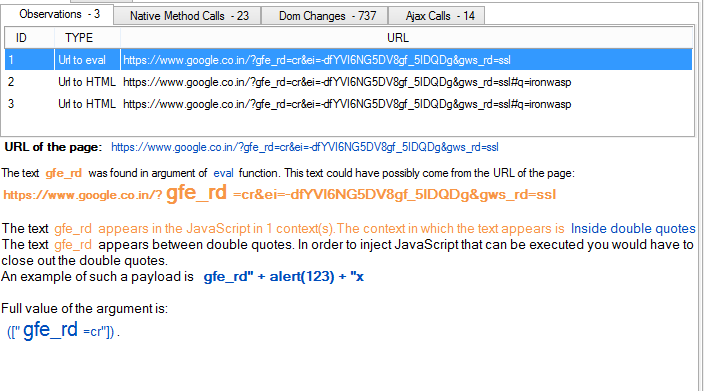 Dominator Pro is perhaps the only effective tool for finding DOM XSS right now. I had tried to address this problem through static analysis, the very first version of IronWASP came with a fancy debugger-style visual taint tracking system. I had even debated the merits of static analysis with Stefano. But the short comings of static analysis are far too important to ignore. Just knowing that the keyword eval is present in a page is of very little practical use, unless we know if it actually gets called and if it does then what were the values of the arguments that were passed to it. This can only be achieved through dynamic analysis, so after working together with Nafeez we made this possible in IronWASP. These events are logged under the sections 'Native Method Calls', 'Dom Changes' and 'Ajax Calls'. In addition these events are also analyzed to see if any portion of the URL appears in the sensitive sections of these events. If a match is found then it is shown under the 'Observations' section, along with some basic suggestions on how you can test to see if the observation is actually a valid security problem. 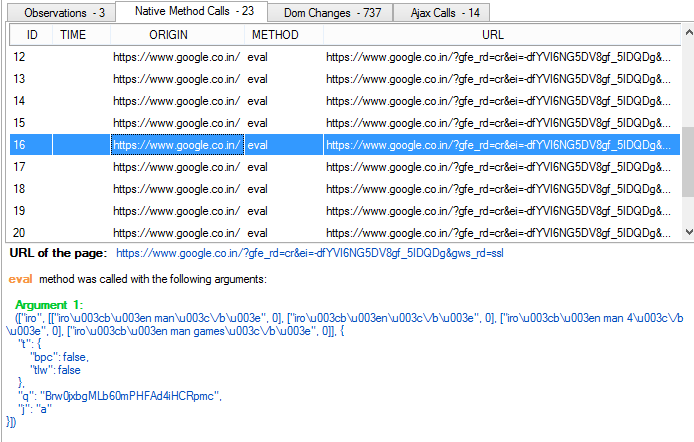 And there were 3 instances where some part of the URL ended up in eval calls and in the new HTML elements that were added. The image below shows the report corresponding to one of the observations. This is version 1.0 of this feature. I have already got feedback for new additions from some of the wonderful people who attended my nullcon talk and also from Mario himself! I would be addressing these concerns in the future versions along with expanding the scope of the events we monitor. If you have any feedback that you think could help improve this feature then please do share them with me. Please follow @ironwaspsec to keep track of all IronWASP related updates easily.